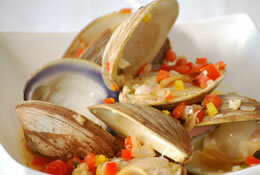 Nutritious, quick and easy to prepare, quahogs make excellent chowders, soups and stews. They can also be stuffed and baked or used in sauces. 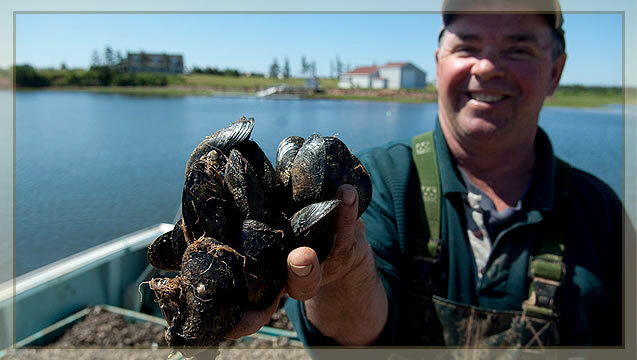 Quahogs are the main ingredient in most varieties of the well-known New England clam chowder. 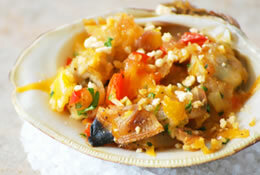 Place the quahogs in a sauce pot with white wine, cover and steam until they are opened. Remove from the pot and allow to cool. Remove the meat from the shells and chop coarsely. Reduce the liquid that is left in the pot by half. Separate the top and bottom of each shell and set aside. Heat a medium size sauté pan to medium heat. Sauté the peppers, shallots, and garlic in the olive oil until translucent. Add 1 cup of the steaming liquid and the lemon juice to the pan. Reduce by half and set aside to cool. Combine the chopped quahogs, the mixture from the pan, and all of the other ingredients that are left. Season with salt and pepper to taste. Place some of the mixture into each half shell. They can now be refrigerated for use later or cooked immediately. Cook in a preheated oven at 350 F for 10 to 12 minutes. They can now be refrigerated for use later or cooked immediately. Cook in a preheated oven at 350 F for 10 to 12 minutes.